Open iPub - Asking the right question? Title: Asking the right question? I have friends and acquaintances who fall on all sides of the vaccination question, from anti-vax to pro-vax and, perhaps, everything in between. They also fall on all sides of the self-righteous spectrum. But asking whether or not one is "pro" or "anti" vaccination always struck me as the wrong question. I consider myself neither. Kind of like how people tend to talk about taxes. Are you "pro" or "anti" taxation? Another red herring that fails to ask the real questions: Who decides what the tax criteria and structure are? Is there meaningful democratic control over budgets and the allocation of resources? Is there democratic control over subsidies and social spending? Who benefits and loses from the way taxes are levied and resources spent? How can we make reforms to a tax system that will make society more egalitarian, fair, just, and democratic? With vaccinations it sometimes seems similarly divided and unreflective at both extremes. And avoids asking some of the questions I find most compelling: Which vaccines for which diseases? Is there a risk associated with a particular vaccine backed by relevant evidence (especially, but not necessarily exclusively, in peer-reviewed medical journals)? Even if the answer to this is "yes," do the risks of the particular disease, and the risks of compromising "herd immunity," outweigh the risks of the vaccine to particular individuals? When do the rights of collectives outweigh the liberties of individuals, and vice versa? How are subsidies and research & development into vaccines being prioritized? If we're so worried about "collective rights" when it comes to ridiculing and shaming anti-vaxxers, why aren't we fighting for public, democratic control over all aspects of health care, including research and development of vaccines, as well as other forms of disease prevention. Why are collective rights so important as a bludgeon against anti-vaxxers but not as a simultaneous argument for things like a collective right to clean water, clean air, and the right not to be poisoned by private sector chemicals, pesticides, and so on, in our water, earth, and food? I find it very interesting how the "needs of the many" outweigh the needs of the few (when it comes to shaming anti-vaxxers), but how quickly that turns into appeals to "personal freedom" on matters of private sector rights to destroy our entire planet. We already accept that an individual's freedom can sometimes legitimately be curtailed in the interests of "the many." That is what a quarantine is: a moral justification to curtail individual freedom. Many people understand that, and in the right context would voluntarily quarantine themselves to protect their own loved ones. (We can even draw on pop culture references to the Zombie Apocalypse to illustrate this point.) And for those who wouldn't do so voluntarily, we seem to understand that coercion can sometimes be justified to impose quarantine on others. The moral arguments for mandatory vaccinations can be equally compelling, when the disease in question is life-threatening or even life-altering. But shouldn't these same moral arguments for mandatory vaccination also apply to other kinds of collective good? Why is government and the private sector constantly allowed to compromise collective "herd immunity" by spraying us and our food with pesticides, by opposing proper food labelling, by undermining social spending on health care, and by fostering the growth of inequality and poverty, which is by far the greatest social determinant of compromised immunity? Do you honestly think that anti-vaxxers are a bigger threat to "herd immunity" than a Tory government hellbent on slashing social spending, scientific research, census gathering, libraries, education, pensions, undermining efforts to defend our rights to a clean environment, and constantly promoting efforts to undermine meaningful democratic control over our lives, and ensure that wealth "trickles up" in ever-concentrated fashion? Poverty and malnourishment are vastly greater threats to herd immunity. If only we reserved the same kind of self-righteous indignation and shaming for Tory and neo-liberal austerity measures as we seem to express so freely against anti-vaxxers. Finally, and having said all that (including noting the moral basis behind arguments for mandatory vaccinations of certain kinds), it's still absurd in my opinion to be "pro" vaxx about anything and everything. 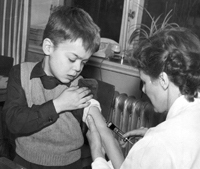 Science, and the "experts" agree that vaccinations in general have saved lives, but they don't always agree about particular vaccinations in particular moments. This year, for example, experts are actually saying that flu vaccines may only have an effectiveness of less than 5% for the upcoming season. (Public Health England is saying only 3.8% effectiveness this season.) Does it make sense to be "pro-vaxx" to the point of denying that immunization effectiveness for flu vaccines for the current year is so low that getting a flu shot is almost pointless? As with so many issues that become polarized, it seems to me that the framing of this debate is a bit of a red herring, lacks empathy and proportionality, and needs greater specificity (as to which vaccines one is talking about, and even, sometimes, for which year).